Please note: We offer a Folic Acid IV Infusion treatment, which may be more potent and beneficial in general. 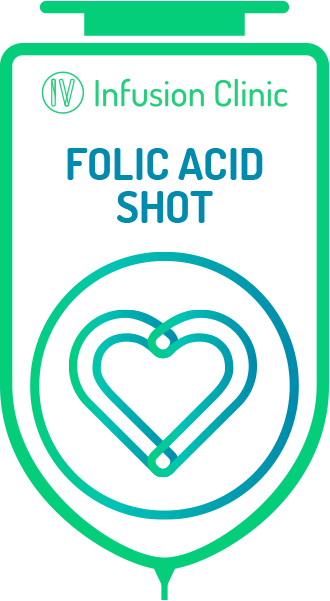 We also offer Folic Acid as an intramuscular (IM) injection (also known as a Shot) for a variety of reasons. Among which may include the instruction of your prescribing Medical Doctor or Fertility Specialist. Or as another example, it may quite simply be that you are short of time, and you prefer to have a quick Shot and be one your way, rather than spend the time required for an IV Infusion Treatment. Please also note: The formulation for a Folic Acid Shot is different to that of the Folic Acid IV Infusion Treatment. 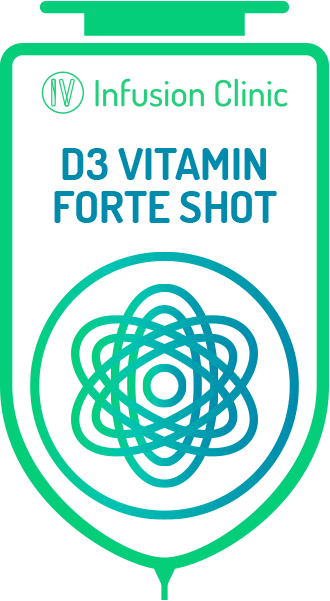 Primarily that each Folic Acid Shot contains only Folic Acid 15mg and Disodium Edetate 2mg, yet not the Electrolyte Solution present in the standard Folic Acid IV Infusion Treatment. 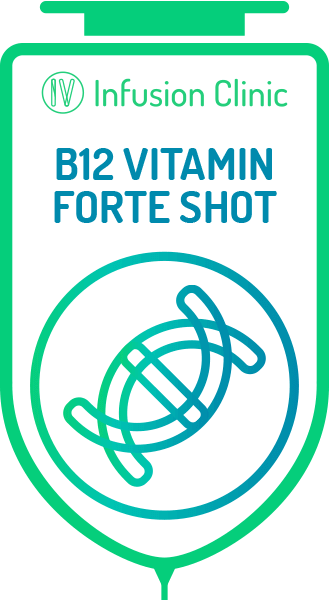 Furthermore, since an intramuscular Shot is delivered differently into the body, its effects may manifest differently. Please Note: We do not offer treatment to women who are pregnant. May Help Reduce "Brain Fog"
May reduce low iron related lethargy, low iron related fatigue, low iron related irritability and tiredness. 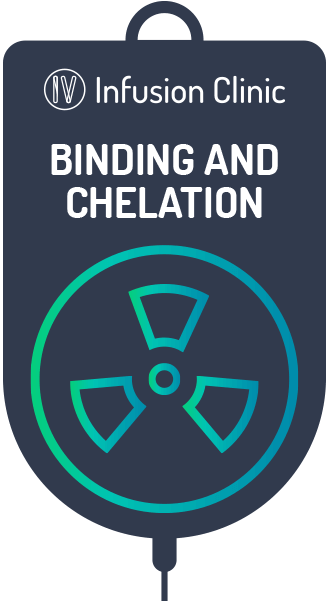 May lessen a sense of a physical weakness due to low iron levels, susceptibility to infection, and shortness of breath. An iron level boost may result in better mental concentration, and increase your ability to physically exercise and get fit. May help boost fertility in aspiring Soon-to-be-Mothers. May help aspiring Soon-to-be-Mothers get and stay pregnant. May help enable the best developmental conditions for your baby to develop well in the womb. 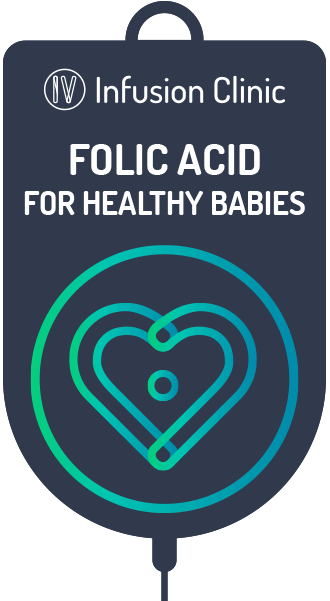 Folic acid is the synthetic form of Vitamin B9 (or Folate). It has many benefits for the the heart, muscles, hearing, ageing, cancer, depression, is important for mental + emotional health, and crucial for proper brain function. All the stated benefits of our version of the famous Myers Cocktail (i.e. 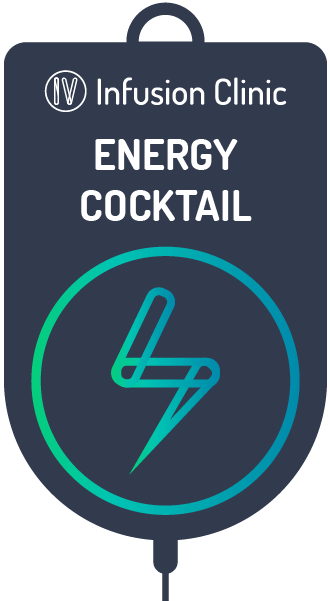 the Energy Cocktail). 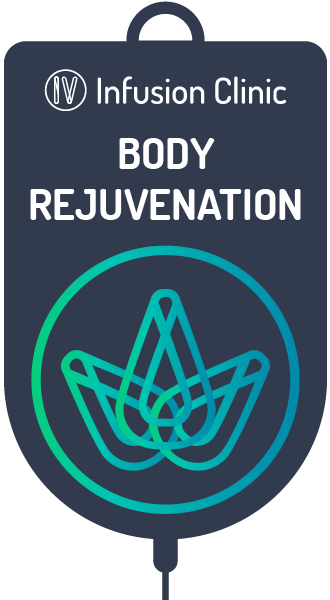 All the stated benefits of our Body Rejuvenation IV Infusion including multi Vitamin B (B1, B2, B3, B5, B6) and Glutathione. 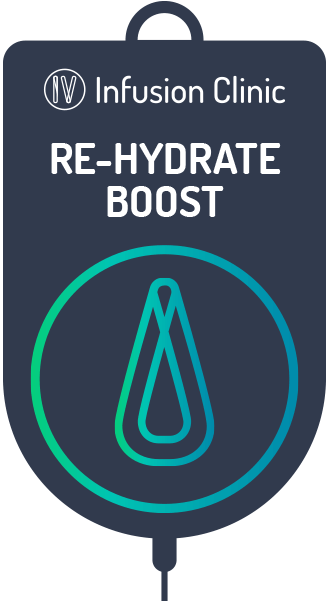 Contains almost 1 Litre of an electrolyte solution used in our Re-Hydrate Boost delivered intravenously (IV) direct into your bloodstream. Keeping you super hydrated. 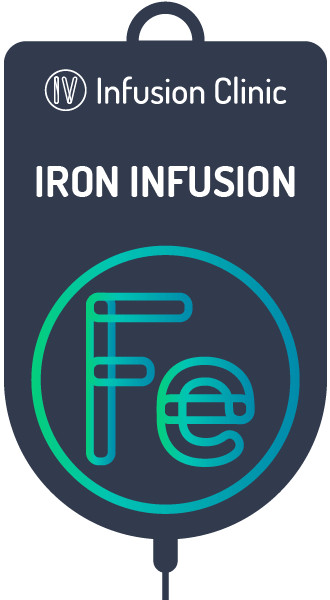 The ultimate IV Infusion for those of us who soldier the compounding demands of a strenuous lifestyle. 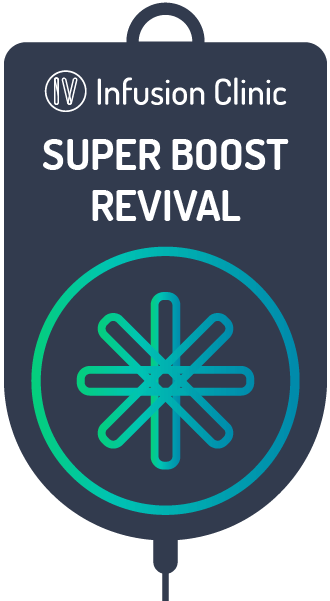 Myers Cocktail (contained in this Energy Cocktail and Super Boost Revival) may potentially reduce Chronic Fatigue, and reduce the effects of Chronic Fatigue Syndrome. This Energy Cocktail may potentially reduce muscle fatigue — a feeling of tiredness or exhaustion or a need to rest because of lack of energy or strength — resulting from overwork, poor sleep, worry, boredom, or lack of exercise. Potential boost in detox activity, immunity, and mental focus. 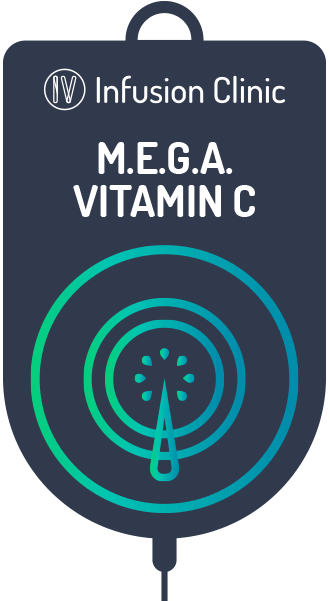 Potential to induce fast acting sustained energy. Glutathione is often called "The Mother of All Antioxidants" and may work toward a body detoxification and enhance supple skin. Glutathione may help with skin elasticity and anti-ageing. Vitamin B Complex (i.e. vitamins B1, B2, B3, B5, and B6) as an IV infusion may boost physical vitality and alertness, and reduce brain fog.